Chacraraju SE Face Expedition. 2004. | Great Escape. Nick Bullock. Chacraraju Este en Los Andes. The Mount Everest Foundation, the British Mountaineering Council, the Sports Council, Mammut, D.M.M. Rab and Outdoor Designs. Dates: 31st May 2004, to 7th July 2004. Climbers: Nick Bullock and Al Powell, and by default Adam Kovach. Abstract: A summit of the East peak of Cashan. 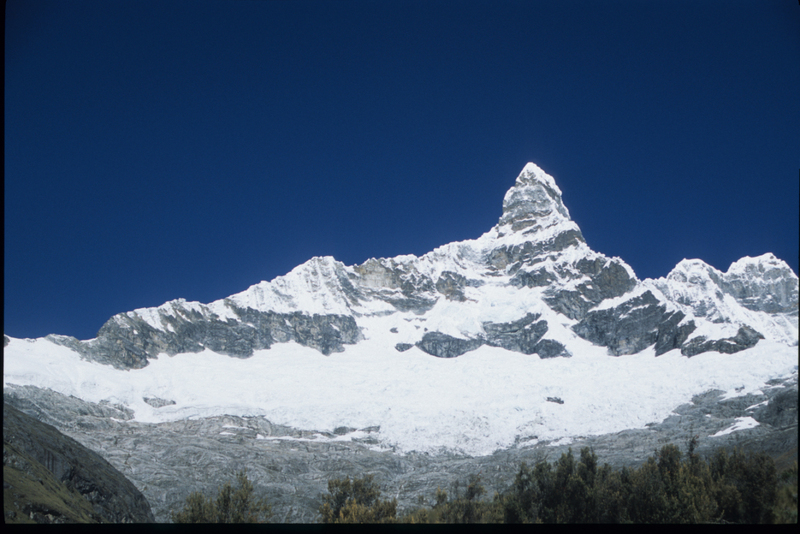 The 5600m subsidiary peak of Cashan Este, 5723m. An attempt on the unclimbed Southeast Ridge of Chacraraju Este 6001. 1st ascent of a three pitch direct finish to the Jaeger Route on the south face of Chacraraju Este ED1. Originally intending to attempt a direct line in the centre of the East face of Chacraraju Este, but in the face of unsettled weather and finding that two Slovenians had climbed it in 2000 and subsequently been killed in Nepal, thus never publicising their route as it deserved, Al Powell and myself decided to make an attempt on the whole of the unclimbed Southeast Ridge from the Quebrada Ranincuray. 31st May fly from Heathrow Airport London. 1st June arrive in Lima and travel to Hauraz. 2nd Acclimatisation and food shopping in Hauraz. 4th Travel from Hauraz to Olleros and walk to acclimatisation base at approximately 4200m from the Quebrada Rurec. 5th Move up to bivy at approximately 5200m for an attempt at Shacsha NW slopes AD, but finding the face stripped of snow we set out at 3.30am for the subsidiary east peak of Cashan. 6th Reach the summit of Cashan East at 8am, return to bivy, base and Hauraz. 7th Rest day and sort kit in Hauraz. 8th Food shopping in Hauraz. 9th Travel to Vaqueria, sort Burro’s and Arrieros for the following day. 10th Walk into base camp at the head of Quebrada Ranincuray and load carry to proposed high bivy. 13th Intended move to bivy, but due to poor weather 2nd rest day. 15th 1st day of climbing on the Southeast Ridge. Start climbing at 2.30am. 16th 2nd day of climbing on Southeast Ridge and descent to the South Glacier in the evening. 17th Traverse the South Glacier and cross the lowest point of the Southeast Ridge back to the high bivy and on to base camp. 19th Bullock to Colcabamba to inform Arrieros we are ready for a pick-up. 22nd Powell Leaves for Lima. Bullock food shops for intended return to Chacraraju Este South Face. 23rd Powell flies out of Peru, Bullock travels in to Laguna 69 and Meets Swedish climber Adam Kovach. 24th Intended attempt at solo of Jaeger Route on the South Face of Chacraraju Este is postponed due to inclement weather. 25th Bullock and Kovach move up to the edge of the glacier and set camp. 26th Bullock and Kovach set out to attempt the Jaeger Route at 1am and return 20 hours later having simu-soloed the Jaeger route and climbed direct to the ridge, completing a new finish. 30th Food shopping and kit sort in Hauraz for an attempt on Copa South Face. 1st July Travel up the Quebrada Honda and walk in to approximately 4100m up the Quebrada Ruripaccha. 2nd July move up to 4500m and set camp for an attempt on the unclimbed South Face of Copa. 3rd Return to Hauraz due to the dangerous condition of the face (plastered in fresh snow) and continuous snow fall through the night and the following morning. 4th Rest in Hauraz and bullock collects bus tickets for return to Lima. 5th Bullock travel to Lima. 6th Bullock fly from Lima. 7th Bullock arrives back in Britain. Travel: We flew by our usual airline carrier, American Airlines. Not the cheapest but with a 60kg baggage allowance certainly worth the extra. The change at Miami is very short so it is probably advisable to make the transfer elsewhere, there are several options available. Unfortunately most American Airline flights get you in Lima too late for the night bus to Hauraz, so as for the previous four years we slept in the airport till 6am. Taking a taxi from the airport is expensive; generally the most you will need to pay is $10. There are several coach companies running through the morning for Hauraz. We find Ormenio to be the best as it is the earliest to set out from Lima. A sur-charge will have to be paid for extra baggage, generally doubling the cost of a ticket, which is approximately £5. The journey to Hauraz takes approximately 8 hours and will stop for lunch. Haruaz is a bustling, thriving city, but once out of its dusty grip the people live a very simple farming, pastoral existence. Cows, sheep, goats, donkeys and chickens are numerous, as are dogs! Where the land is too steep to plough, gum trees grow, as well as grass and cactus. Wheat is grown extensively, as are potatoes and other root crops. Higher in the valleys, groves of ancient Quenal Trees give the slopes a tropical and mysterious feel. Rock: In general rock is not the mainstay of The Cordillera Blanca, although there are exceptions such as the Sphinx on The Esfinge in the Paron. There are miles of solid unclimbed granite in the quebrada walls, which have only recently been touched. The rock on the ridges tends to be very loose but on some of the faces it can also be excellent but compact. Snow and ice: The weird and wonderful mushroom formations are what make Peruvian mountaineering very interesting. They form mainly on the ridges and to our dismay this year, lived up to all of the hype. Unprotected, bottomless, and very scary. If treated with disrespect, the ridges of Peru will be your downfall. Double cornices form readily and hang over the faces threateningly. Sometimes it will be impossible to top-out because of the cornices hanging over your line. In general the north Faces will be of good neve and ice because of the sun they receive, but a word of warning, don’t get caught on them in the midday sun, especially without anti-ball plates! Weather: Normally the settled weather patterns in the Cordillera Blanca are the reason to climb there. Unfortunately this year coincided with the El Nino, a once every seventh year disruption in the reliable pattern. For the whole time we were in Peru the wind and weather came from the East. This is the direction bad weather invariably approaches and only once for the length of this years trip, the sky remained clear for more than one day. On all other days rain fell in the valleys, and inches of fresh snow fell on a daily basis. The glaciers and faces were covered in fresh powder making conditions very questionable. Waste Management: As always a very minimal approach was taken, and all litter was removed and disregarded in Hauraz, the benefit of a small independent team, climbing in an alpine style. The acclimatisation peak of shacsha 5703 was chosen originally but we didn’t plan for the dry conditions in the mountains due to Peru having had no precipitation through the wet season because of the El Nino. So on finding our easy AD snow rib as a loose and crumbling rock climb, we decided to look elsewhere. Just to the right in fact on the East subsidiary peak of Cashan 5600m. This proved a very straightforward high altitude glacier plod but did the job wonderfully. Having discovered in Hauraz ‘our’ line had been climbed on the East Face of Chacraraju Este 6001, and with the unsettled weather frequently covering the face making any chance of a possible free attempt, (The Slovenian team gave the climb a grade of U.I.A.A. 7+ WI6 and A2) impossible, we turned our attention to the unclimbed Southeast Ridge. The Japanese had climbed the final steep headwall in 1976 but they had climbed to the base of the headwall by climbing a 60º fluting on the south face and then proceeded to fix the headwall over many days. It was our ill-conceived and naive intention to climb the whole length of the ridge finishing with a free ascent of the headwall. On the 15th of June at 2.30, easy access to the ridge from a col of consolidated snow, led to a steep rock buttress. This was turned on the right by gloveless rock climbing with crampons and sacks and proved to be quite testing, approximately U.I.A.A. 6, although the difficulties were short and well protected. This led to the ridge crest, where moving together proved the norm, until the crest became overhanging and thin and bulbous formations had to be negotiated by climbing either the south face, (steep bottomless powder and loose rock) or the North (rotten, washed out ice holding together a crumbling mess of rock). Several overhangs of ice were climbed direct on the crest by tunnelling, approximately Scottish grade V. Most of the climbing was of a very tenuous and worrying nature and the pitches tended to be of approximately 90m. At 4.30 pm a perfect bivy site presented and was too good to miss. Still with settled weather we started to climb at approximately 7.30am. Immediately the route finding and the nature of the climbing intensified. A large garndarm of snow was turned on the left, south face, which proved to be unstable. Large blocks of granite pulled, and the snow was powder. The crest was reached and although the snow was more consolidated because of the sun, it was only feet wide and overhanging. At times it proved quite worrying to be looking down hundreds of feet through the platform you were stood on. Two more pitches of a similar nature were climbed and while never more than Scottish V in technicalities the outcome should one of us fall, was too dire to contemplate. The safest time was at the point where Al was on one side of the ridge and I on the other. The pitches were still an average of 90m. Powell led a pitch traversing around another outrageous snow formation by moving down onto the north face. Extremely loose, gravel type rock held together with rotten ice was the order of the day and a very stressful hour later he had completed the pitch. Again the technical difficulty was probably only Scottish mixed V, but this bared no relation at all to the ground covered. I led a melting vertical wall of rotten ice leading back to the crest, Scottish V, and belayed beneath a large overhang of sagging snow. On joining me, we could see the ridge ahead looked a lot harder and very dangerous and considered it would take approximately two days of climbing to reach the headwall. We both considered the dangers unjustifiable and set about descending onto the South Glacier. Setting out at approximately 9.30am a traverse of the South Glacier beneath the section of the Southeast Ridge we had climbed, led to the South side of the snow col climbed on day one. Crossing here put us back into the Quebrada Ranincuray where kit from the high bivy was collected and base camp was reached at 4pm. Chacraraju Este, 1st Ascent of Direct finish to The Jaeger Route. (Running on Empty) ED1. We rapidly came to the conclusion; it would make sense to join together and simu-solo, side-by-side. Not only would this make crossing the glacier safer, it would make the descent a lot easier, as he only carried one 40-metre length of 5mm cord, and I carried only one length of 50-metre 7mm cord. Our joint collection of gear for this adventure was as follows: 3 ice-screws, 5 pitons, 2 extenders, 1 full set of wires, an Ablikov-threader, a few screw gates and a lot of tat. After reaching Laguna 69 we experienced rather unsettled weather for the evening of the 23rd and the following day of the 24th. Fortunately, both on the same wavelength we had brought enough food for 5 days. On the 25th the weather was still cloudy and unsettled but tiered with the wait, we moved up to the edge of the glacier and set a camp. At 1am on the 26th we left camp to cross, the now covered in fresh snow glacier, thanking our luck at meeting each other for this fraught crossing. Reaching the base of the Jaeger Line at 3.40am we started to climb, simu-solo. The condition of the face was excellent, powder snow, not to deep, on the less steep sections; with hard, clear, water ice on the steep steps, giving sustained Scottish grade 1V/4 climbing and the odd section of V.
At approximately 10.00 am we reached the large bowl 150 metres from the summit. It is here the Jaeger Line traverses right, across slabs and exits right, beneath the cornice. We decided a mixed line, at the left-hand side of the bowl looked more interesting and appeared to lead to a gully between flutings and on to the summit ridge. Given our lack of a full rope, or even a single half rope and lack of a good selection of gear the more direct, leftward rising line probably was not the most sensible option. The three pitches below were all climbed on a single length of 50-metre 7mm cord! Pitch 1, Scottish V1/7, 50 metres, covering poorly protected ground (possible no-doubt to place more gear if carried). A slightly left, rising line. A mixed pitch, covering steep 80-90º loose rock, thin iced corners and a 100º overhang of ice to exit. Led by Kovach. Pitch 2: Scottish V1/6, 50 metres. Covering an even more poorly protected line which pulls through an overhang at the start, (rock and ice) then traverses around an overhanging corner of rotten rock by space walking unprotected, unconsolidated, bottomless powder flutings until reaching a runnel of good ice which is climbed direct to belay beneath a final rock wall. (Not a good belay, 2 axes, a poor blade, and a thread of ice). Lead by bullock. Pitch 3: the final pitch. Scottish V/5. Climb direct from the left of the rock wall, steep ice of the aerated, pure water and unconsolidated type, typical of Peru and into a runnel of bottomless powder. A poor ablikov thread for protection and then the final powder swim until the summit ridge is reached, Kovach then deciding the whole lot is to dangerous to belay and bring me up, rappelled from the Ablikov returning to a disgruntled Bullock, who then climbed the pitch anyway reaching the Ablikov and leading the final 10 metres to the summit ridge also. These three pitches run parallel to the Peruvian/Spanish line climbed August 21st 1984 by A. Garcia, F. J. Escola and W. Silverio, and exit the next point to the right on the summit ridge. The summit was not climbed to, as life appeared more favourable. Descent was made by rappelling the line climbed. Approximately 15 rappels were made on ablikov threads and an occasional piece of rock gear on the left of the initial couloir. The final 150 metres were down-climbed. The camp on the edge of the glacier was reached at 9pm, 20 hours from starting. Equipment: For Nick Bullock all clothing was supplied by Mammut. For Al Powell all clothing was supplied by RAB. A revolutionary bivy tent was used with superb result. This was designed by Al Powell and constructed by Outdoor Designs. Stove and Fuel: An alpine gas burner was used in a Markhill hanging set. Canisters of propane/butane mix gas was burnt which is now widely available in Hauraz at $5 per cartridge. Food: All the necessary food is available in Haruaz although a few favourites were brought along. High-energy drinks are not available in Hauraz so bring them also. Below is a summary of the finances for the trip. We were fortunate to receive good grants from The MEF/BMC and The sports Council, which eased the financial burden considerably. Nick Bullock and Al Powell would like to thank Ken Wilson and Rich Cross for the references. Also the M.E.F./B.M.C. and The Sports Council for grants, which made this trip possible. Thanks also to Mammut/D.M.M. Rab and Outdoor Designs.